Starting this month, I will be writing a feature article entitled, “Civil Rights History: On This Day.” These articles will explore important civil rights events from the past, but which continue to inform and influence civil rights discussions to the present day. To start off the feature, we look back to April 4, 1968. 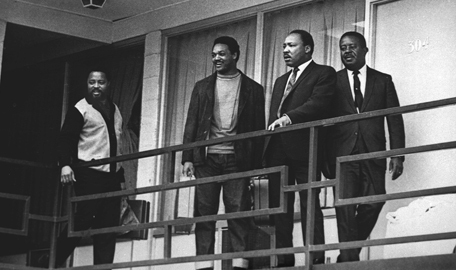 On this day in history, civil rights leader Martin Luther King, Jr. was shot and killed at a Memphis, TN hotel. King had traveled to Memphis to participate in protests involving the rights of Black sanitation workers. Following his “I Have A Dream Speech,” which occurred in 1963, King’s civil rights work increasingly focused on class and poverty issues, rather than strictly on race. Petty crook James Earl Ray initially pleaded guilty to King’s slaying, but then later recanted. Ray claimed that he had been set up. Nevertheless, despite his recant, Ray’s conviction was upheld numerous times, and he died in prison. Following King’s assassination, widespread violence broke out across the U.S., engulfing nearly 100 cities. Members of the King family, as well as many others, maintain the belief that King was the victim of a government assassination plot. Whether government plots against King included assassination is unclear. However, what is clear is that the FBI waged a fierce campaign against King and his civil rights activities, branding King a communist and attacking his family relationships. An excellent discussion of these efforts by the FBI can be found at History.net. Today, as he did when he delivered the “I Have A Dream” speech, King typifies the noble goal of racial equality in the United States. Is it a goal still unmet? How would King assess the state of race relations if he were alive today? On the one hand, we are led by the first African-American President in our nation’s history, Barack Obama. As a result, one might argue that the United States looks scarcely like the United States of the turbulent 1960s era. Yet, income and educational disparities between the races – particularly African-American and whites – remain a significant problem. And, as we have seen in recent months, growing political divisiveness in our country, which I frankly believe is unmatched by anything since the 1960s civil rights movement. What do you think King would have to say? This entry was posted in activists, civil rights, Equality, race and ethnicity and tagged African-American Civil Rights Movement, Civil and political rights, I Have A Dream: Writings And Speeches That Changed The World, james early ray, martin luther king. Bookmark the permalink.